International journalist, freedom fighter and Block Report correspondent Gerald Perriera speaks on world politics four years after the assassination of Qaddafi and two years after Chavez. We cover Libya, Eritrea, the Ivory Coast, Ethiopia, Zimbabwe, Nigeria, South Africa, Somalia, Venezuela, the FMLN, the Sandinistas, Mali, Niger, France, the U.S. and more. 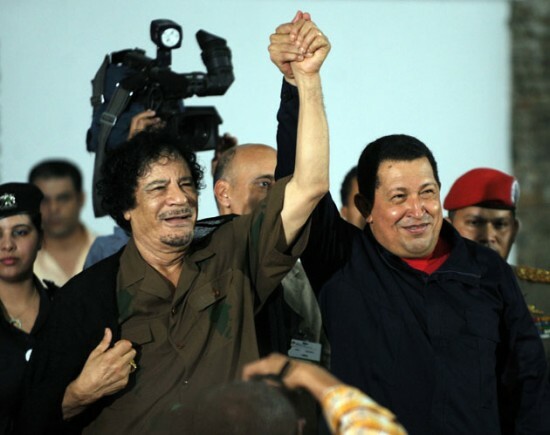 Venezuelan President Hugo Chavez declares his nation’s support for Muammar Qaddafi and an independent Libya on Feb. 25, 2011, and implacable opposition to a Western invasion. “Libya is a failed state,” Perriera observes, since Qaddafi’s Jamahiriya was destroyed, with several factions and many militias “all doing their own thing.” Some 3 million Libyans who supported Qaddafi now live in exile. Qaddafi’s son Saif was sentenced to death by one faction, but the militia holding him is not turning him over to them. Libyans throughout the country demonstrated against Saif’s death sentence, Perreira reports. And on Sept. 4, thousands poured into streets to celebrate the anniversary of the Al Fateh revolution, the real revolution, in 1969. In South America and the Caribbean, neoliberalism has failed, accomplishing nothing but to “widen the gap between the haves and have-nots,” Perreira notes, and in Venezuela and elsewhere, the people have “voted overwhelmingly for progressive or left-wing regimes and left of center regimes.” Those that still cling to the neoliberal, capitalist model may celebrate their independence, “but what independence,” Perreira asks, when the U.S., Britain and Canada are calling the shots. Next articleRichmond’s Donte Clark, the King of Spoken Word? good work by the author keep it on. thank you very much for this one…. hmmm this is very good. yeah The Design looks very good.. Keep working like that!. Great Post !! Very interesting topic will bookmark your site to check if you write more about in the future………. It's totally comprehensive details. I'll bookmark for following reference….. Very good sharing this interesting blog with us. My pleasure to being here on your blog….